Barbara Moore and M.J. Davis work as conservators and conservation consultants to museums and other collections-holding agencies. 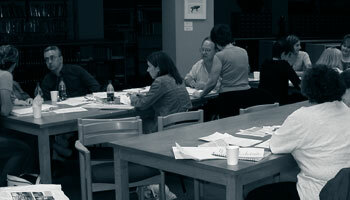 Two years ago, the Foundation of the American Institute for Conservation, in cooperation with the Heritage Emergency Task Force on Emergency Response and with funding from the National Endowment for the Humanities, trained ten senior professionals as instructors in Emergency Response for Cultural Institutions. Moore and Davis were selected to represent the Northeast Region of the US in the "Train the Trainers" program. The curriculum used for "Train the Trainers" was unique in its comprehensiveness, its multidisciplinary approach, its integration of civil and governmental resources, and its focus on the full range of materials found in museum collections. Moore and Davis have both since participated in additional emergency response and recovery training; both had extensive experience teaching various aspects of collections care, including emergency preparedness and response. The Museums SOS workshop focused on emergency response and recovery for institutions responsible for natural history, ethnographic and archaeological collections of artifacts and archives. Utilizing effective response procedures allows an institution to make an immediate, organized, and effective response to an emergency, safeguarding people and minimizing damage to collections and records and interruption of operations and services. Knowledge of salvage techniques allows an institution to recover collections that might otherwise be lost. The one-day workshop lead the participants through the processes of response and recovery resulting from an emergency at their institution. The instructors clarified and defined the terminology that is used, and presented sections on damage assessment and stabilizing the environment; prioritization; and supplies, resources and services. Also discussed were issues of health and safety, teambuilding, and the emotional response to disasters. Also examined were salvage methods available for different classes of materials, and which methods are appropriate to different situations. Images and demonstrations were used to illustrate these topics. While not directly addressing the subject of risk assessment and emergency planning, the workshop helped participants understand clearly the need for an institutional disaster response plan, educated them in the necessary components of that plan, and effectively motivated them to develop such a plan. The instructors borrowed from the American Institute for Conservation a selection of publications on emergency preparedness that were available, with ordering information, at the workshop. Also presented was the "emergency response backpack" (originally developed for the National Task Force training), which contains a selection of safety gear, supplies and tools needed in emergencies that participants can use as a model in developing their own emergency supplies. Participants at the workshop received a binder with resource materials and handouts related to the topics covered during the workshop and available through this website. Please contact Monona Rossol to request a hard copy of this document.